Moncler considers the materiality analysis as an important tool to identify the most relevant environmental and social priorities that are consistent with its business strategy, and to define the contents of the Non-Financial Statement according to GRI international reporting standards. In terms of sustainability reporting, the topics deemed as material (or relevant) are those that have a significant impact on the economic, social, and environmental performance of the Company or that may substantially influence stakeholders’ perceptions and decisions. Accordingly, the materiality analysis is two-fold, as it takes account of the standpoint not only of the Company, but also of its stakeholders. The analysis was conducted by the Sustainability Unit with the support of a specialist consultancy firm, through a structured process involving the Group’s management. • presentation to the Board of Directors. 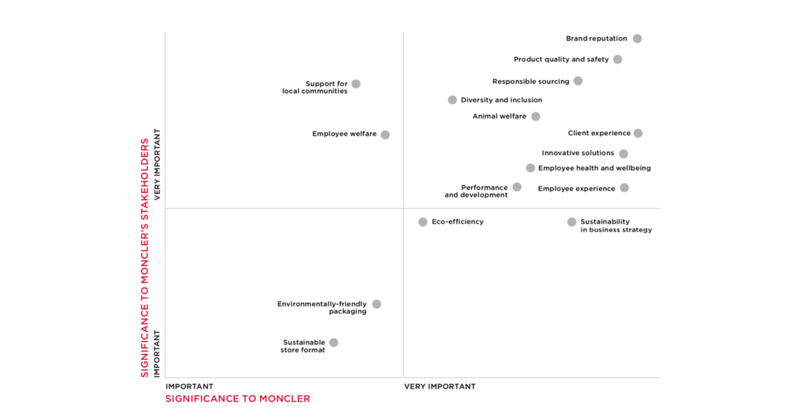 The materiality analysis identified 16 material topics3, including product quality and safety, responsible sourcing, client relations, performance assessment and career development, innovative solutions, animal welfare, employee health and well-being and people experience. 2Global Compact, GRI Standard, OECD Guidelines for Multinational Enterprises. 3Within the scope of the analysis, aspects related to corporate governance, regulatory compliance, and economic performance were considered prerequisites; as such, they were not individually examined in the process, but were nevertheless accounted for in this Statement.